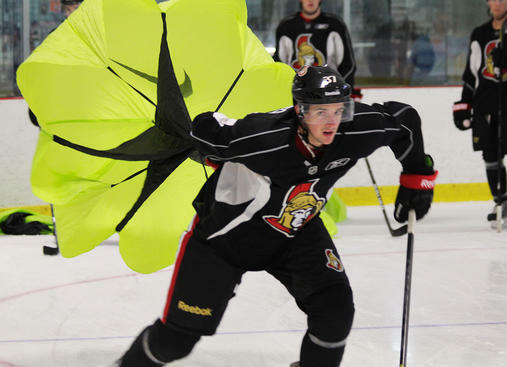 2013 recruit Robbie Baillargeon (photo) is taking part in Ottawa Senators development camp. A former standout forward at Cardinal Cushing who was drafted in the fifth round of the 2012 draft, Baillargeon had an 18-23-41 scoring line in 55 USHL games last season for Indiana and Omaha. Four Terriers are on the roster for Islanders development camp, which begins today at Nassau Coliseum: 2013 recruit Doyle Somerby, the Isles fifth round draft pick in 2012, recent grad Ben Rosen and junior forwards Cason Hohmann and Evan Rodrigues. Senior Garrett Noonan is at Nashville for 2013 Predators development camp. Sophomore goalie Matt O’Connor, recovered from the collapsed lung that ended his freshman season, is in Chicago at Blackhawks development camp. Rising sophomore blueliner Matt Grzelcyk will be in Bruins development camp beginning this Wednesday. The Bruins third-round pick in the 2012 draft earned Hockey East All-Rookie honors after posting a 3-20-23 line in 38 games. Next month, Grzelcyk be in Lake Placid, NY, for National Junior Team Evaluation Camp. Matt Nieto, who signed with San Jose this past March, and sophomore Danny O’Regan, Nieto’s linemate last season and also named to Hockey East's All-Rookie team, will skate in the Sharks’ development camp beginning Thursday. SB Nation has compiled a list of all NCAA players participating in NHL development camps. Former Terrier co-captain and 2009 Hobey Baker Award winner Matt Gilroy has inked a one-year deal with the Florida Panthers. The three-time All-American spent last season with the New York Rangers after playing in the AHL with Connecticut during the lockout. While the NHL is holding its development camps, USA Hockey has begun its annual development camps for Select 15, 16 and 17 year old skaters and organizing these annual tournaments is former Terrier Kenny Rausch, manager of youth hockey for USA Hockey. The versatile Rausch— a forward on BU’s 1995 national championship team, who also filled in on defense when needed—has been involved with USA Hockey in a variety of capacities during the past 17 seasons and spoke about the goals of the development camps. ►Shortly after Jack Parker announced in early March his intention to retire, subscription site U.S. Hockey Report posted a lengthy piece titled Jack Parker and the Wayback Machine. It looks at Parker’s career from his arrival as a freshman at BU in 1964, his mid-season appointment as head coach in Dec. 1973 and the Terriers’ five straight Final Four appearances, culminating in BU’s1978 national championship with a 5-3 win against BC in the title game. USHR’s March articles are now free archives. To find the Parker article, go to http://www.ushr.com/news/20130301 and scroll down to March 17. Former Terrier, Olympic and NHL standout Tony Amonte is coaching the grey squad at this week's USA Hockey Select 16 development camp in WIlliamsville, NY, near Buffalo. Amonte, who scored 126 points in two season at BU (1989-90 and 1990-91) and went on to register 900 NHL points, 12th best among American skaters, now is head coach at Thayer Academy, where he starred before committing to BU.